Best. Chicken. Ever. Get ready to go wild for this one. 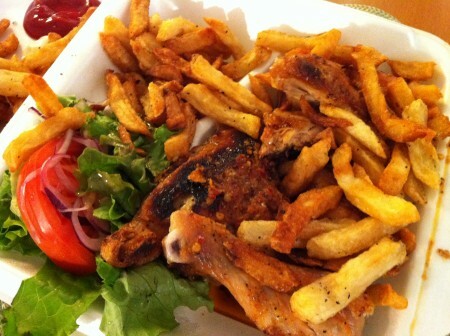 Crispy on the outside, firm but tender on the inside, the chicken at Romados lives up to all that street talk. Yep, it is arguably serving the best chicken in the city. None of that dry, bland tasting meat that you choke down with big gulps of water. Nope, not here. With some seasoning, a bit of spice brushed onto the meat and a little extra gravy for the fries, the taste is incomparable to anything else. Mmm, mmm, mmm. We got a half chicken and two thighs to go. Smothered with fries and coming with a bite of salad, the three of us wolfed down our meals like there was no tomorrow. Yes, we were hungry. But the main accelerator for the speed at which we ate was the tastiness of the food itself. While we did have to wait in line for about fifteen minutes, it was well worth it. If you’re in a hurry, you should call in advance and place your order so that you can skip to the front of the line, pick it up and go. There is a nice selection of Portuguese desserts and pastries as well. We got an assorted dozen so we could try a little bit of everything. The Portuguese egg tarts are to die for. Tags: Cheap, Chicken Thigh, Custard, Dessert, Dinner, Fries, Gravy, Half Chicken, Lunch, Pastries, Portuguese, Rachel, Romados, Salad.